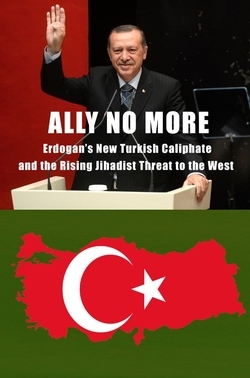 Chapter 6 of Ally No More: Erdogan's New Turkish Caliphate and the Rising Jihadist Threat to the West (Washington: Center for Security Policy Press, 2018), pp. 89-96. In an inarticulate but important statement, then-National Security Advisor H.R. McMaster said in a December 2017 closed-door session that the Islamist threat has been "myopically" treated in the past: "We didn't pay enough attention how [Islamist ideology] is being advanced through charities, madrassas and other social organizations." Alluding to prior Saudi support for such institutions, he noted that it "is now done more by Qatar and by Turkey." Dwelling on Turkey, he added that "A lot of Islamist groups have learned from" its president, Recep Tayyip Erdoğan, and the ruling Justice and Development Party (Adalet ve Kalkınma Partisi, or AKP). The Turks, he went on, offer a model of "operating through civil society, then the education sector, then the police and judiciary, and then the military to consolidate power in the hands of a particular party, which is something we'd prefer not to see and is sadly contributing to the drift of Turkey away from the West." McMaster's frank comments raised eyebrows for breaking with the usual Washington patter that nostalgically recalls the Korean War followed by decades of near-sacral joint membership in the North Atlantic Treaty Organization (NATO). His mention of Turkey drifting away from the West raises several questions: Beyond pious words, how real is the NATO alliance in 2018? Should Turkey even remain a NATO partner? Does NATO still have a mission in the post-Soviet era? If so, what is it? 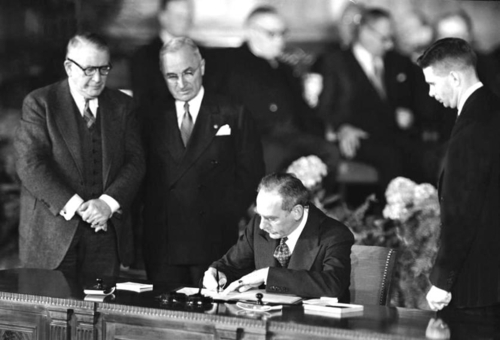 To understand NATO's mission, let's return to the alliance' founding on April 4, 1949. The Washington Treaty establishing it had enunciated a clear goal: to "safeguard the freedom, common heritage and civilization of member states' peoples founded on the principles of democracy, individual liberty, and the rule of law." In other words, NATO protected Western civilization. At the time, yes, that meant allying against communism, so NATO focused on the Soviet threat for 42 long years. Then, one day in 1991 when the Soviet Union collapsed and the Warsaw Pact vaporized, the alliance faced a crisis of success. U.S. Secretary of State Dean Acheson signed the Washington Treaty witnessed by President Truman (2nd from left). An existential period of self-questioning ensued, asking whether the alliance should continue to exist and whom it might be protecting against. (As it turns out, Russia eventually returned as an opponent, but that is not our topic here.) The most convincing answers offered held that, yes, NATO should continue, and mobilize defenses against the new great totalitarian threat, Islamism. Fascists, communists, and Islamists differ one from the other in many ways, but they share a common dream of radical utopianism, of molding a superior human who exists to serve his government. The new Islamist enemy rose to global prominence just as the prior one had been defeated, quickly dispelling airy notions about a liberal consensus or the "end of history." In 1977, Islamists took power in Bangladesh; in 1979, in Iran. Also in 1979, the government of Saudi Arabia turned sharply toward radicalism. In 1989, Islamists took over in the Sudan; in 1996, in most of Afghanistan. Jihadi attacks on NATO members, and especially the United States, proliferated during this period. Some 800 Americans lost their lives to Islamist violence before 9/11, with the attempted 1993 World Trade Center bombing offering the best insight into the Islamists' supreme ambitions. Willy Claes (L) and José María Aznar. By 1995, this threat had become sufficiently apparent that NATO Secretary General Willy Claes compared Islamism to his organization's historic foe: "Fundamentalism is at least as dangerous as communism was." With the Cold War over, he added, "Islamic militancy has emerged as perhaps the single gravest threat to the NATO alliance and to Western security." 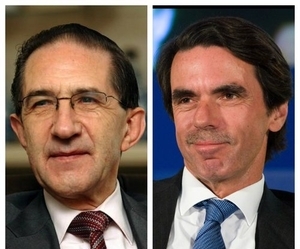 In 2004, former Spanish prime minister José María Aznar made similar points: "Islamist terrorism is a new shared threat of a global nature that places the very existence of NATO's members at risk." He advocated that the alliance focus on combating "Islamic jihadism and the proliferation of weapons of mass destruction." He called for nothing less than "placing the war against Islamic jihadism at the center of the Allied strategy." So, right from the beginning of the post-Soviet era, perceptive leaders called for NATO to focus on Western civilization's new main threat, Islamism. Two countries then symbolized that threat: Afghanistan and Turkey. 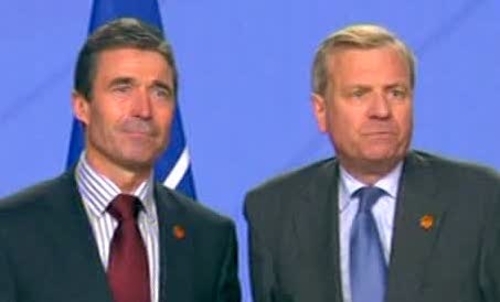 They represented, respectively, unprecedented external and internal challenges to NATO. Article 5 of the NATO charter, the critical clause requiring "collective self-defense," was invoked for the first and only time not during the Cuban missile crisis or the Vietnam war but a day after the 9/11 attack. To emphasize: not the Soviet, Chinese, North Korean, Vietnamese, or Cuban Communists but Al-Qaeda and the Taliban hiding in the caves of a peripheral country (Afghanistan) prompted a member state to take this momentous step. That's because Islamists, not Communists, dared strike the American centers of power in New York City and Washington, D.C.
Further, Al-Qaeda and the Taliban are but a small part of the global jihad movement. The Iranian nuclear buildup, now with a legitimate path to making bombs within the decade, represents the single most deadly problem, especially when one factors in the apocalyptic regime ruling in Tehran and the possibility of an electromagnetic pulse attack. Small-scale attacks present less danger but occur constantly, from a mosque in Egypt to a bridge in London to a coffee shop in Sydney. Islamist insurgencies have sparked civil wars (in Mali, Libya, Yemen, and Syria) and semi-civil wars (in Nigeria, Somalia, Iraq and Afghanistan). For five months, a branch of ISIS held the city of Marawi in the Philippines. Jihadi attacks occur in non-NATO countries with Muslim majorities and minorities alike: Argentina, Sweden, Russia, Israel, India,Myanmar(Burma), Thailand, and China. Jihadis have also struck many NATO members, including the United States, Canada, the United Kingdom, Spain, France, the Netherlands, Germany, Denmark, and Bulgaria. Beyond political debilitation and terror, these attacks have seriously impaired military capabilities by reducing training and distracting up to 40 percent of the active military forces from their core mission and instead doing police work – protecting synagogues, schools, and police stations. And then there is Turkey. In the good old days, NATO provided Turkey with security, primarily against the Soviet Union; in turn, Turkey offered it an invaluable southern flank. Even today, Turkey has NATO's second largest military; combined with Americans, they make up, 3.4 million out of 7.4 million troops; together, the two countries contribute 46 percent of the total from 29 allies. But much changed with the AKP's parliamentary victory in November 2002. Erdoğan famously stated soon after that "Turkey is not a country where moderate Islam prevails," and he lived up to that promise, with his government sponsoring Islamic schools, regulating male-female relations, alcohol, mosque building, and more broadly seeking to rear a "pious generation." Erdoğan's rule has built on Islamism's despotic nature: he rigged elections, arrested dissident journalists on terrorism charges, created a private army, SADAT, had his police engage in torture, and staged a coup d'état. On the last point: the alleged coup of July 2016 gave the government the opportunity to detain, arrest, or fire over 200,000 Turks, shutter some 130 news outlets, and jail 81 journalists. The Committee to Protect Journalists calls Turkey "the world's biggest prison for journalists." Without many noticing, a near-civil war now rages in Turkey's southeast, as Erdoğan appeases his new Turkish nationalist allies by trying to eliminate the expression of Kurdish language, culture, and political aspirations. Fear spreads, totalitarianism looms. NATO's direct problems with Turkey began on March 1, 2003, when the AKP-dominated parliament denied American forces access to Turkish airspace to conduct the war against Saddam Hussein. 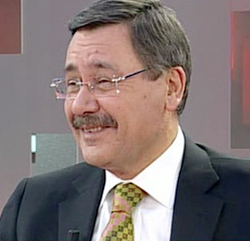 Former mayor of Ankara Melih Gökçek. The Turkish government threatens to overrun Europe with Syrian refugees. It obstructs NATO relations with close allies such as Austria, Cyprus, and Israel. It has sponsored a turn of Turkish opinion against the West, in particular against the United States and Germany. As an example of this hostility, the mayor of Ankara, Melih Gökçek, tweeted in September 2017 that he prayed for more storm damage after two major hurricanes, Harvey and Irma, ravaged parts of the United States. Ankara has taken Germans and Americans as hostages for political leverage. Deniz Yücel, a German journalist of Turkish origins, was jailed for a year until the German government agreed to upgrade Turkey's tanks. Peter Steudtner, a German human rights activist, spent several months in jail. Andrew Brunson, Protestant pastor, is the most conspicuous American hostage but there are others, including Ismail Kul, a chemistry professor, his brother Mustafa, and Serkan Gölge, a NASA physicist. To put this in personal terms, I (and many other analysts of Turkey) cannot even change planes in Istanbul out of fear of being arrested and thrown in jail, serving as a hostage to be traded for some real or imagined Turkish criminal in the United States. Imagine that: Turkey, a supposed ally, is the only country in the world I fear arrest on arrival. Dissident Turks in Germany have either been assassinated or fear assassinations, such as Yüksel Koç, co-chair of the European Kurdish Democratic Society Congress. Additionally, thugs in Turkish government employ have attacked Americans in the United States, most notably, at the Brookings Institution in 2016 and at Sheridan Circle, outside the Turkish embassy in Washington, in 2017. The Turkish government sides with Tehran in various ways: it helped the Iranian nuclear program, assisted with the development of Iranian oil fields, helped transfer Iranian arms to Hezbollah, and joined in supporting Hamas. The Iranian chief of staff visited Ankara, perhaps to develop a joint effort against the Kurds. Ankara joined the Astana talks with the Iranian, Russian, and Turkish governments to decide Syria's destiny. Erdoğan has quasi-joined the Shanghai Cooperative Organization; while a bit of a sham, it is the closest thing to a Russian-Chinese counterpart to NATO. Turkish troops have engaged in joint exercises with Chinese and Russian militaries. Most significantly, the Turkish armed forces are deploying the Russian S-400 anti-aircraft missile system, a step wildly inconsistent with NATO membership. Then there is the Aegean Army. Yiğit Bulut, a top aide to Erdoğan, stated in February 2018 that Turkey needs a force "fortified with Russian and Chinese-made fighter jets because one day [the U.S. government] ... may very well consider attacking Turkey." Not exactly, you might observe, the sentiments of an ally. And if that sounds conspiratorially kooky, the possibility does exist, as of this writing, of a U.S.-Turkish confrontation in the Syrian town of Manbij. Tensions have reached such a point that a White House statement informs us that President Trump "urged Turkey to exercise caution and to avoid any actions that might risk conflict between Turkish and American forces." In addition to its hostility, Turkey's presence in NATO distorts the alliance. NATO should be about fighting Islamism. But if Islamists are already within the tent, how is the alliance going to do so? 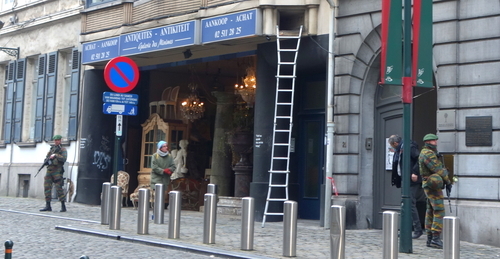 This dilemma became public in 2009, with the term of Secretary General Jaap de Hoop Scheffer ending in July. A consensus existed that the new secretary general should be the Danish Prime Minister since 2006, Anders Fogh Rasmussen. In other words, he was the country's prime minster during the Danish cartoon crisis. When Muslim-majority country governments, including the Turkish one, pressed him to take actions against the cartoons, he very correctly stated: "I am the Prime Minister of a modern, free country, I can't tell papers what to print or not to print, it's their responsibility". He even refused to meet with a delegation of ambassadors from Muslim majority countries. Passing of the NATO baton in 2009 from Secretary General Jaap de Hoop Scheffer (R) to Anders Fogh Rasmussen. Three years later, however, with Rasmussen a candidate for secretary general of NATO, the Turkish government had its say. Then-Prime Minister Erdoğan recalled the cartoon crisis: "I asked for a meeting of Islamic leaders in [Denmark] to explain what is going on and he refused, so how can he contribute to peace?" A lot of bargaining followed, ending in a compromise: Rasmussen was appointed secretary-general on condition he publicly appease Erdoğan, which he did: "I would make a very clear outreach to the Muslim world. To ensure cooperation and intensify dialogue. I consider Turkey a very important ally and strategic partner, and I will cooperate with it and our endeavors to ensure the best cooperation with the Muslim world". Translated out of bureaucratese, he said: "I wouldn't do anything to upset the prime minister of Turkey." This signaled, obviously, not a robust NATO leading the fight against Islamism, but an institution hobbled from within and incapable of standing up to one of its two main threats for fear of offending a member government. I personally witnessed this when a NATO Parliamentary Assembly delegation walked out of a meeting my organization had prepared, in deference to its Turkish members. NATO faces a dilemma and choice: Freeze Turkey out, as I advocate, or to keep it in, as is the institutional instinct. My argument holds that Ankara takes steps hostile to NATO, is not an ally, and obstructs the necessary focus on Islamism. In short, Turkey is the first member state to go over to the enemy camp, where it will likely remain for a long time. The argument to keep Turkey in boils down to: Yes, Turkey under Erdoğan is wayward but NATO membership allows a modicum of influence over it until it returns, as it will eventually. Or, in Steven Cook's formulation, "Turkey remains important less because it can be helpful but more because of the trouble that Ankara can cause." So, which is a higher priority? Free NATO to fulfill its mission? Or maintain influence over Ankara? It comes down to a sense of how long Turkey will remain Islamist, dictatorial, and heading toward rogue status. Seeing the wide anti-Western consensus in Turkey, I want NATO free to be NATO. Analysts (including myself in 2009) who agree with this conclusion sometimes say, "throw Turkey out"; but NATO lacks a mechanism for expulsion, as no one imagined the current problem back in 1949. That said, many steps are available to diminish relations with Ankara and reduce Turkey's role in NATO. Abandon Incirlik Air Base: Ankara capriciously restricts access to Incirlik (prompting German troops to depart it) and the base is perilously close to Syria, the world's most active and dangerous war zone. Plenty of alternate sites exist, for example, in Romania and Jordan. According to some accounts, this process has already begun. Pull American nuclear weapons: Incirlik hosts an estimated 50 nuclear bombs; they should be removed immediately. This vestige of the Cold War makes no military sense and, reportedly, planes based at Incirlik cannot even load these weapons. Worse, it is just conceivable that the host government might seize these arms. Cancel arms sales: The U.S. Congress overrode an Executive Branch decision in 2017, rejecting a proposed personal arms sale in response to the Turks' DC thuggery. Far more importantly, the sale of F-35 aircraft, the most advanced fighter plane in the American arsenal, must be blocked. The F-35 aircraft that Turkey has not and must not receive. Ignore Article 5 or other requests for help: Turkish aggression must not drag NATO members into war because of the Kurds, and they have made this clear. In reaction, Erdoğan needles NATO for the benefit of his domestic audience: "Hey NATO, where are you? We came in response to the calls on Afghanistan, Somalia and the Balkans, and now I am making the call, let's go to Syria. Why don't you come?" Distance NATO from the Turkish military: Stop sharing intelligence, do not train Turkish personnel, and exclude Turkish participation in weapons development. Help Turkey's opponents: Stand with the Kurds of Syria. Support the growing Greek-Cyprus-Israel alliance. Cooperate with Austria. In brief, Communists never provoked Article 5 and no NATO member ever entered the Warsaw Pact. Islamism, in the shape of Al-Qaeda and Erdoğan, has scrambled the old verities almost beyond recognition, requiring new and creative thinking. NATO needs to wake up to these problems. Daniel Pipes, a senior fellow at the Center for Security Policy, has led the Middle East Forum since 1994. With an A.B. and Ph.D. from Harvard, he has taught at Chicago, Harvard, Pepperdine and the U.S. Naval War College. He has served in five U.S. administrations, received two presidential appointments, and testified before many congressional committees. He is the author of sixteen books on the Middle East, Islam, & other topics. Dr. Pipes writes a column for the Washington Times and his work has been translated into 37 languages. DanielPipes.org contains an archive of his writings and media appearances. © 2018. All rights reserved. 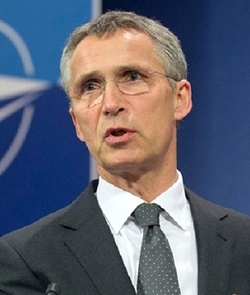 Current NATO Secretary General Jens Stoltenberg. NATO provides support to Turkey. We have missions, military presences in Turkey. We have our surveillance AWACS planes, flying over and helping Turkey. We also have the air-defense batteries called SAMP-T, provided by Spain and Italy. We are grateful to Turkey for their support to NATO. We also show solidarity with Turkey by NATO's military presence in the country, which has been increased over the last years to reflect the instability and threats Turkey is facing from the south, from Daesh, from terrorism, especially in Iraq and Syria.